R.C. Montgomery is a writer and amateur historian and folklorist hailing from the great state of Texas. Since he was but a small boy, he has been captivated by times long before his own, the 1930s and surrounding decades in particular, rebuking many aspects of postmodernity in favor of a life in the days of yore, if only vicariously. A collector of 78 RPM phonograph records, he created Old Time Blues in an effort to bring the marvelous music of yesteryear to an audience of the present day. The illustrious “Daddy Stove Pipe” (not to be confused with “Stove Pipe No. 1” or “Sweet Papa Stovepipe”) holds a number of important distinctions; he was one of the earliest male country blues performers to record, he may have been the oldest, and while definitely not the most prolific, he was surely among the longest-lived. The man ‘neath the stove pipe, Johnny Watson, was reputedly born on April 12, 1867, in Mobile, Alabama. He’s said to have begun his musical life in Mexico around the turn of the twentieth century, playing twelve-string guitar in a mariachi band. Later, he trouped with the Rabbit’s Foot Minstrels, which produced a fair number of prominent black entertainers of the era, including “Ma” Rainey, Bessie Smith, and Butterbeans and Susie. By the 1920s, he had taken up performing on Chicago’s Maxwell Street as a one-man band, playing guitar and harmonica and singing. In the spring of 1924, Stove Pipe traveled to Richmond, Indiana, to cut a record at the Starr Piano Company’s “shack by the track” studio. There, he laid down three sides, “Sundown Blues”, “Stove Pipe Blues”, and “Tidewater Blues”, of which only the first two were released. It is evident that he hit the road after his first session, because by the time he recorded again, in 1927, he was in Birmingham, Alabama, where he waxed three more sides (of which, again, only two were issued) for Starr when they brought down their mobile recording unit. This time around, he was billed as “Sunny Jim” and was joined by an unidentified whistler known only as “Whistlin’ Pete”. In the 1930s, Stove Pipe settled down in Greenville, Mississippi with his wife Sarah, who joined him on the remainder of his pre-World War II recordings as Mississippi Sarah, singing and blowing the jug. They made their first records as a duo for Vocalion in Chicago in October of 1931, waxing eight sides, all of which were released this time. They returned to Chicago four years later for another session—which turned out to be their last—this time for Bluebird, yielding four sides, two more records. Sarah met an untimely demise in 1937, and Daddy Stove Pipe took to traveling again, playing with Cajuns in Louisiana and Texas and returning to Mexico. Eventually, he returned to Chicago’s Maxwell Street, and he became known as a fixture there. He was recorded once last time in 1960 by Björn Englund and Donald R. Hill, playing and singing songs such as “The Tennessee Waltz”, producing four tracks which were released on the Heritage label LP Blues From Maxwell Street (later reissued on a number of other labels). Watson contracted pneumonia following a gallbladder operation, and he died in Chicago on November 1, 1963. 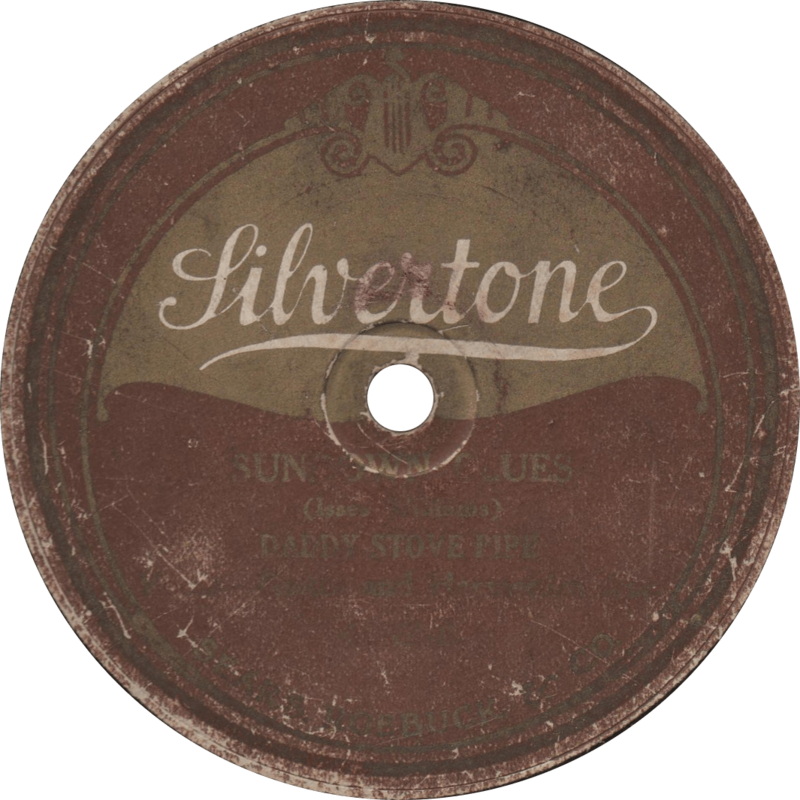 Silvertone 4042 was recorded in Richmond, Indiana, on May 10, 1924, and originally released on Gennett 5459. It was also issued on Claxtonola 40335. Unfortunately, it is recorded rather faintly, which causes the harmonica and guitar to be somewhat drowned out by the surface noise on this worn copy, especially near the beginning of each side, though Watson’s vocals are still relatively prominent. I will defend its merits in saying that I have never yet encountered a particularly clean-playing example of these sides. On the “A” side, Watson plays and sings the delightful “Sundown Blues”. Examination of the contemporaneous photograph depicting Daddy Stove Pipe seated next to an acoustical recording horn reveals him holding an unusual nine-string guitar, with the first, second, and third strings doubled as would be on a twelve-string guitar (as opposed to Big Joe Williams’ unique configuration), which may be the instrument played herein. Sundown Blues, recorded May 10, 1924 by Daddy Stove Pipe. 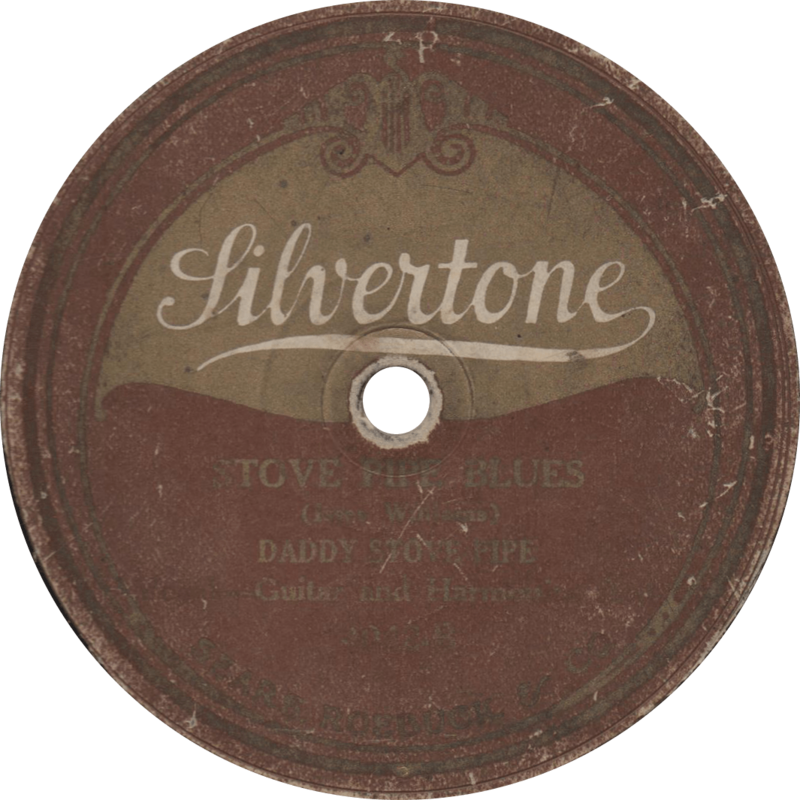 Stove Pipe Blues, recorded May 10, 1924 by Daddy Stove Pipe. 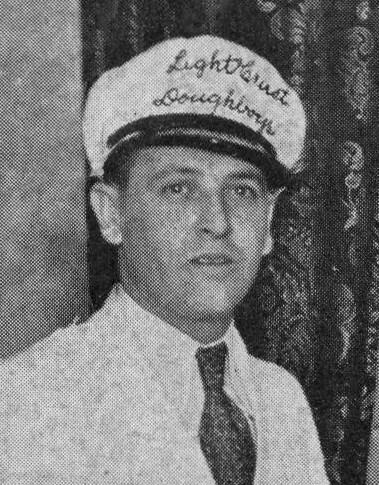 Milton Brown, during his tenure with the Light Crust Doughboys. Circa 1931. The fourth of April, 2019, marks a historic occasion, for on this day eighty-five year prior, Milton Brown and his Musical Brownies made their debut recordings, and they surely did so with a bang. Milton Brown first cut a record in Dallas, Texas on February 9, 1932, while still a member of “Pappy” O’Daniel’s original Light Crust Doughboys. He left that band not long afterward, and started his own, the Musical Brownies, which would gain him considerable renown. When the Victor record company returned to Texas in April of 1934, Brown and his Brownies traveled to San Antonio for a session at the Texas Hotel. The Brownies’ musical excellence was demonstrated by their first track, “Brownie’s Stomp”, played masterfully and hotter than anything, and laid down in one take without a hitch. Thereafter, they submitted a total of seven additional sides to hot wax, including the classics “Four, Five or Six Times” and “Garbage Man Blues”. The following August, they returned to San Antone and recorded once again for RCA Victor, immortalizing a further ten performances, including blues songs like Memphis Minnie’s “Talking About You” and the Mississippi Sheiks’ “Just Sitting On Top of the World”, pop songs like “Girl of My Dreams” and “Loveless Love”, the old-time number “Get Along, Cindy”, and the waltz “Trinity Waltz”. That session concluded the Brownies engagement with the Victor company; in 1935, they made a longer journey to Chicago, to begin a longer and more fruitful contract with Decca, which lasted until 1937, holding one final session after Milton Brown’s untimely demise the previous year. Bluebird B-5775 was recorded at the Texas Hotel in San Antonio, Texas on April 4, 1934, the first two sides from Brown’s first session with his Musical Brownies. The Musical Brownies consist of Cecil Brower on fiddle, Derwood Brown on guitar, Ocie Stockard on tenor banjo, Wanna Coffman on string bass, and “Papa” Fred Calhoun on piano. Both are instrumental numbers, so Milton sits them out aside from an occasional holler or shout. The Brownies’ “Joe Turner Blues”—a different melody than the 1915 W.C. Handy composition, apparently attributed (though both names are misspelled on the label) to the Brownie’s fiddler Cecil Brower and Milton Brown himself—is a superbly orchestrated blues instrumental, beautifully demonstrating their musical talent. This “Joe Turner Blues” became a standard of Texas string band repertoires and was later recorded in 1937 by the Hi-Flyers and in 1940 by Adolph Hofner and his Texans. 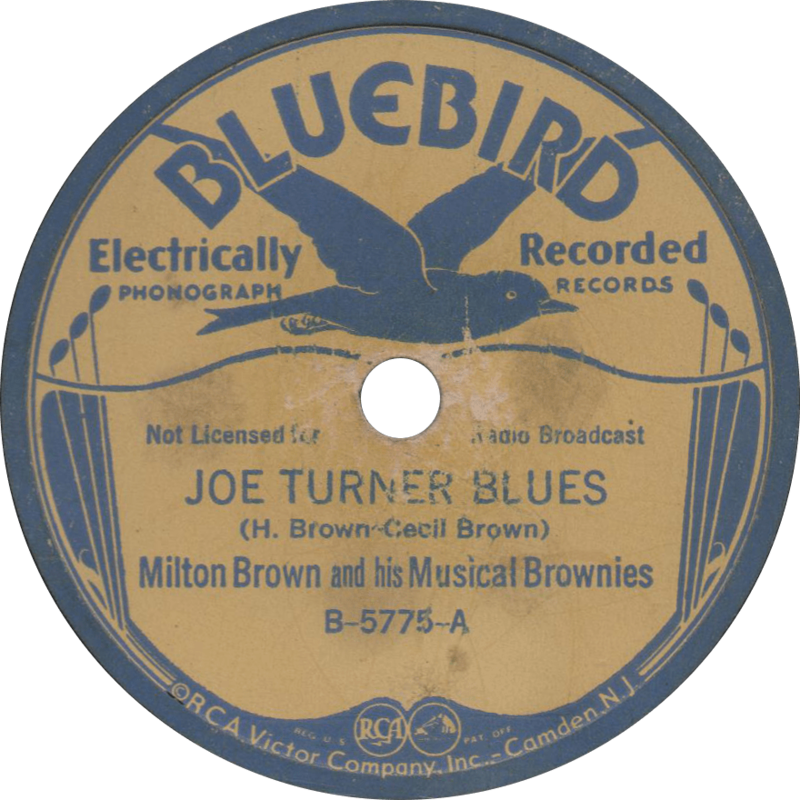 Joe Turner Blues, recorded April 4, 1934 by Milton Brown and his Musical Brownies. “Brownie’s Stomp” on the other side—their first side recorded—is a real show piece, with hot solos by every Brownie. 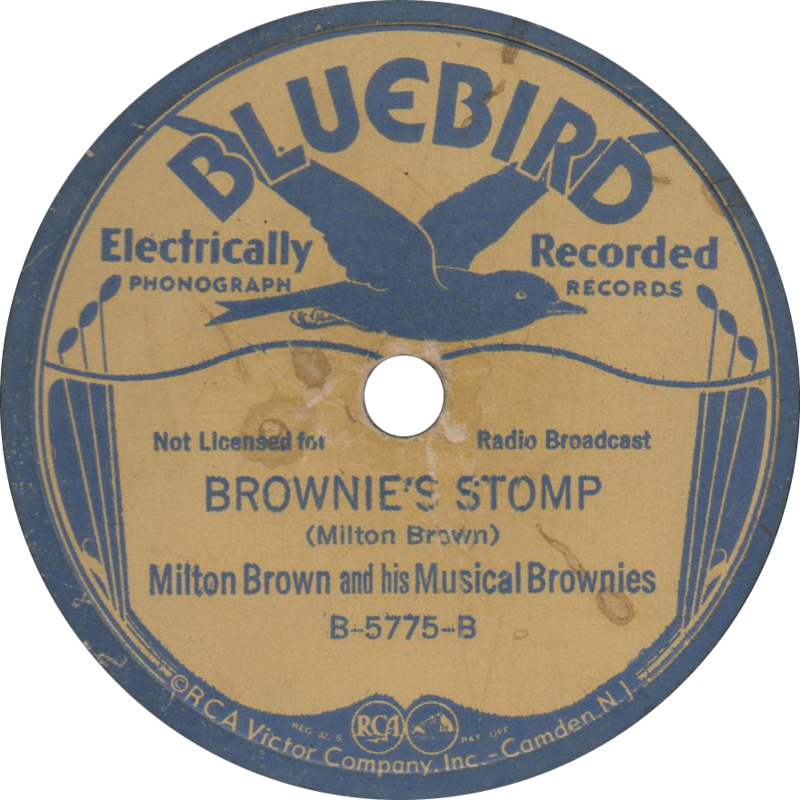 Brownie’s Stomp, recorded April 4, 1934 by Milton Brown and his Musical Brownies. If there is a figure more deserving of the title of “Father of Country Music” than Jimmie Rodgers, one such contender is Fiddlin’ John Carson, who, while not the first to make records of what could be called “country music,” was undoubtedly one of the first to find great success doing it. John William Carson was born in the north of Georgia—county of Cobb or Fannin—on the twenty-third of March, though there is dispute as to which year, probably 1874, though some sources suggest 1868 (earlier census documents, as well as his death certificate, agree with the later date, while later ones support the earlier year). Before turning to life as a musician, Carson found work on the farm and railroad, as a jockey, making moonshine, and in an cotton mill. In 1913, Carson participated in the first Georgia Old-Time Fiddlers’ Convention, coming in fourth in the fiddling contest. He went on to take home first prize from the Convention a total of seven times between 1914 and 1922, earning him the nickname “Fiddlin’ John”. In the cradle days of radio broadcasting, Carson made his debut on the Atlanta Journal station WSB on September 9, 1922 to great public acclaim. Soon after, he was noticed by Atlanta furniture dealer and Okeh record distributor Polk C. Brockman, who spotted Carson in a newsreel of a fidders’ convention, and persuaded Okeh record man Ralph S. Peer to record the fiddler. On the fourteenth of June, 1923, Fiddlin’ John Carson made his first record at 24 Nassau Street (now 152 Nassau Street NW) in Atlanta, cutting only two sides. Peer reportedly thought the two tunes were “plu-perfect awful,” but released the record nonetheless, and was surprised when sales took off like a skyrocket. Whatever Peer’s personal taste, he was too smart to pass up a sure thing, and it was clear that the people wanted what Carson had to offer. Before Carson’s recording career began, fiddler’s Don Richardson and A.C. “Eck” Robertson had made records of “country” music, in 1914 and 1922 respectively, but both did so only sporadically and without enormous success. Carson, on the other hand, began recording prolifically in the wake of his debut session. Five months after cutting his first two sides, Fiddlin’ John traveled to New York City for another session, this time laying down a total of twelve sides, a number of which, like “You Will Never Miss Your Mother Till She’s Gone” and “Be Kind To a Man When He’s Down”, achieved considerable success. Though far from the most skilled fiddler or talented singer, Carson appealed to record-buyers of the 1920s with his folksy manner and archaic sound that evoked memories of simpler times, which many longed for in the days of fast living, T-Model Fords, and New South industrialization. Carson was also politically active within his state of Georgia, and used his music as a tool to further those ends, such as to promote the populist Democrat Tom Watson, or to condemn the accused Leo Frank for the 1913 murder of thirteen-year-old Mary Phagan. He continued to record for Okeh until 1931, producing a total of 155 sides, of which all but seventeen were released. Many of those featured his daughter Rosa Lee Carson, better known as Moonshine Kate, and band the Virginia Reelers. Three years after concluding his engagement with Okeh, Carson went to Camden, New Jersey, to begin a new series of recordings for RCA Victor’s Bluebird label, an arrangement which only lasted but two consecutive sessions in February of 1934. In those two marathon sessions, Carson, with Moonshine Kate, guitarist Bill Willard, and banjoist Marion “Peanut” Brown, recorded twenty-four sides, all of which but four were released, many of which were re-dos of his popular Okeh recordings. Thereafter, he retired from professional musicianship. In his later years he worked as an elevator operator in the state capitol of Georgia. Fiddlin’ John Carson died in Atlanta on December 11, 1949. 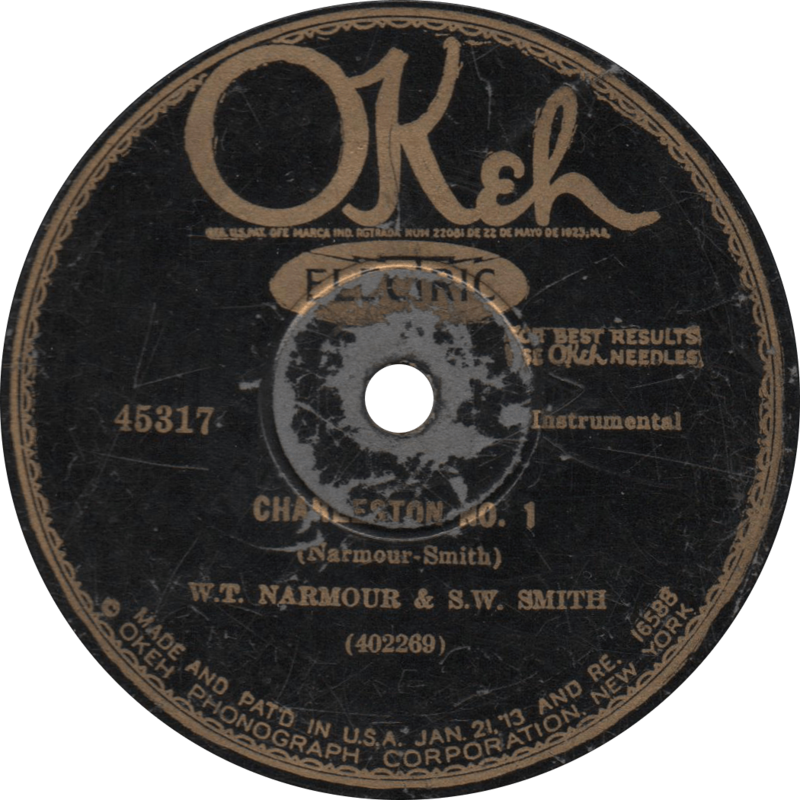 Okeh 4890 was recorded around June 14, 1923, in Atlanta, Georgia. These are takes “B” and “A”, respectively, both the earlier of two released takes of each side (only the latter of which are listed as issued in the DAHR). Firstly we hear Carson’s history-making performance of the once-popular 1871 minstrel song by Will S. Hays: “The Little Old Log Cabin in the Lane”. 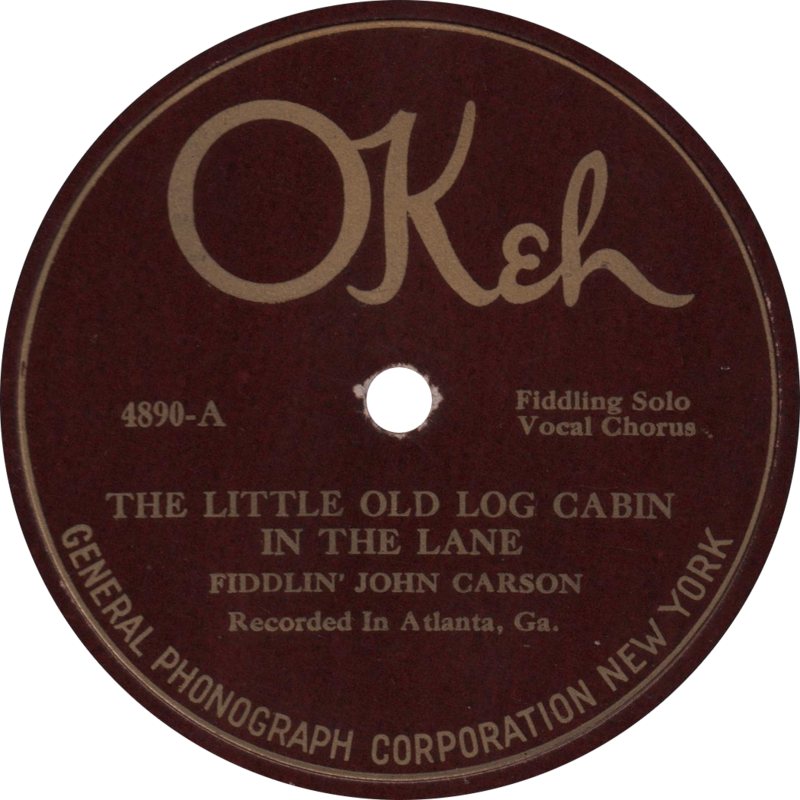 The Little Old Log Cabin in the Lane, recorded c. June 14, 1923 by Fiddlin’ John Carson. Nextly, Fiddlin’ John delivers an equally rustic performance of “The Old Hen Cackled and the Rooster’s Going to Crow”. The Old Hen Cackled and the Rooster’s Going to Crow, recorded c. June 14, 1923 by Fiddlin’ John Carson. One of the truly outstanding acts of old-time music was the fiddle and guitar duo of Narmour and Smith, who were quite comparable—both in style and ability—to the Stripling Brothers of Alabama, personally I’d even go so far as to venture that I might like these two better. The pair was made up of William Thomas Narmour, the fiddler, and Shellie Walton Smith, who played the guitar. Narmour was born on March 22, 1889 and Smith on November 28, 1895, both in Carroll County, Mississippi, where they spent most of their lives. Narmour learned his craft as a boy, on a fiddle fashioned for him by his father—also a fiddler—from a cigar box. He joined forces with Smith, his neighbor, to provide music at local functions. When Smith was unavailable, Narmour sometimes with the local blues musician Mississippi John Hurt. At a 1927 fiddle contest in Winona, Narmour and Smith were discovered by record dealer, talent scout, and veterinarian Dr. A.M. Bailey, who referred them to the Okeh company to cut a record. Thus, they traveled some hundred miles north to Memphis, Tennessee, to record their first six sides on February 15, 1928. Those first thee discs proved a considerable success, and so the duo returned to the recording microphone the following year, this time traveling a longer distance to Atlanta, Georgia. That session resulted in one of the most successful “hillbilly” records of the time, a two-sider featuring “Charleston No. 1” and “Carroll County Blues”. Its popularity was so that six months later Narmour and Smith took a train all the way to New York City, where they put down another eight tunes on two September days, plus an appearance on Okeh’s “Medicine Show”, a musical skit record much like those made by the Skillet Lickers. They concluded their Okeh engagement in 1930, with two sessions in San Antonio, Texas. After four years of recording silence, Narmour and Smith returned to Atlanta for one final marathon session, this time for Bluebird, who had also poached the talents of fellow old-time stars Fiddlin’ John Carson and Gid Tanner’s Skillet Lickers for their respective last recordings. In all, the duo of W.T. Narmour and S.W. Smith left behind a recorded legacy of nearly fifty sides. Both Narmour and Smith remained in their native Carroll County for the rest of their lives, living primarily as farmers, and later finding work at the local school as a bus driver and janitor, respectively. Narmour also operated a garage in Avalon. Willie Narmour died on March 24, 1961, two days after his seventy-second birthday. Shell Smith followed him seven years later on August 28, 1968. Okeh 45317 was recorded March 11, 1929 in Atlanta, Georgia by W.T. Narmour and S.W. Smith, at their second session. Narmour playing the fiddle, and Smith on guitar. Unfortunately, this junk store copy is quite worn; both sides play fairly well for the first two-thirds or so, becoming quite crackly toward their ends (such that if I tried to clean them up, I’d surely lose my mind). Nevertheless, both sides still put out a strong signal over the crackle. “Charleston No. 1”, as its name would suggest, was the first in a series of “Charlestons” played by Narmour and Smith, up to “No. 3”. They later re-recorded the three “Charlestons” for Bluebird in 1934 titled as “The New Charleston”. The number is said to take its name from Charleston, Mississippi, rather than the popular dance or the likewise named cities in South Carolina or West Virginia. Charleston No. 1, recorded March 11, 1929 by W.T. Narmour & S.W. Smith. 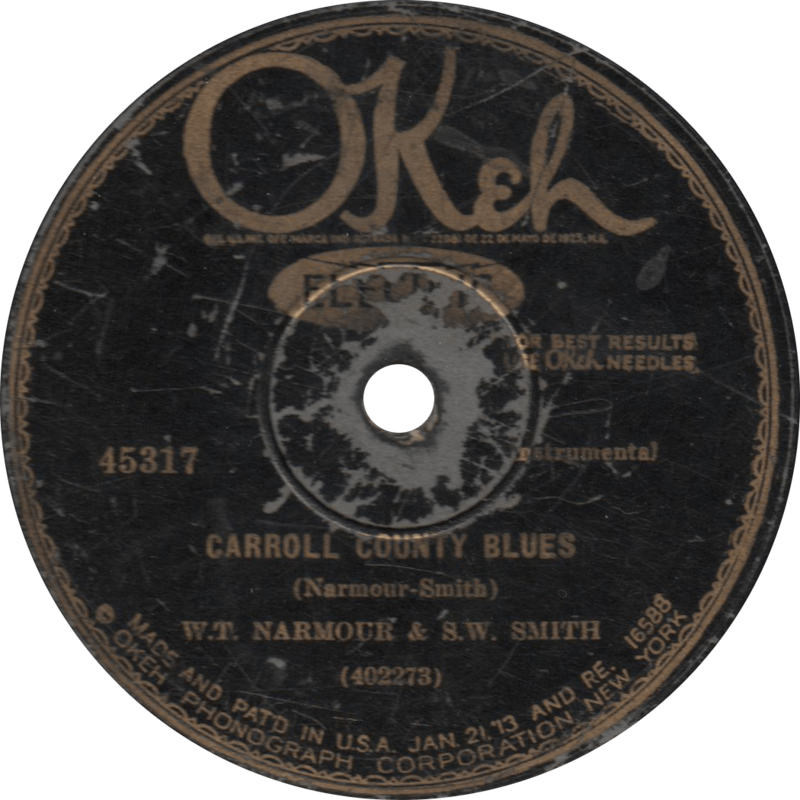 Narmour and Smith’s famous “Carroll County Blues” is a sublime performance, a prime example of just how these two really could get right. Like with the previous number, they later followed up “Carroll County Blues No. 2” and “No. 3”, and re-made all three for Bluebird as “New Carroll County Blues”. Carroll County Blues, recorded March 11, 1929 by W.T. Narmour & S.W. Smith. Dating to four years after the close of the second World War, these two sides are a little past the typical era of material presented on Old Time Blues, but their excellence earns them a position among the ancients. They are the work of the artist who succeeded Blind Lemon Jefferson as “King of the Texas Blues”—and perhaps the coolest man to ever walk the earth—the legendary Lightnin’ Hopkins. The man who would become “Lightnin'” was born Sam John Hopkins on the fifteenth of March in either 1911 or 1912, in Centerville, Texas, located halfway between Dallas and Houston. He moved with his mother to neighboring Leona after the death of his father in 1915. While attending a church picnic in nearby Buffalo, Texas, around the year 1920, the eight-year-old Hopkins encountered Blind Lemon Jefferson, who was providing music for the function. Jefferson instilled the blues in Hopkins, and the young boy was inspired to build a cigar box guitar for himself and start down the path of a musician. He began his musical career with Jefferson—who purportedly scolded the young musician for joining in his music-making, but allowed him the rare privilege of playing alongside him once he became aware of Hopkins’ age—and his cousin “Texas” Alexander. By the middle of the 1920s, Hopkins was living as an itinerant musician, a streak which was cut short by a stretch spent in the Houston County Prison Farm, on charges unknown. After his release, Hopkins returned to his hometown and found work as a farmhand, giving up music for a short time. By the end of the Second World War, Hopkins had picked up his guitar once again and went back to Houston to sing on street corners. There, in 1946, he was discovered by Lola Anne Cullum, a talent scout for the Los Angeles, California-based Aladdin Records. Hopkins traveled to California, and made his first records accompanying Texas piano man Wilson “Thunder” Smith, which gained him his nickname “Lightnin'”. Recording a total of forty-three sides for Aladdin between 1946 and ’48, Hopkins went on to make discs for numerous other labels over the course of his long career. He settled in Houston by the beginning of the 1950s, and began recording for Bill Quinn’s Gold Star label, producing some hit records such as “‘T’ Model Blues” and “Tim Moore’s Farm”. Already popular with southern black audiences, Lightnin’ became endeared to the folk and blues revivalists thanks to the promotion of Texas musicologist Mack McCormick in 1959, and he appeared at Carnegie Hall on October 14, 1960. In 1962 he made the album Mojo Hand, introducing the titular song, which was to become a standard of his repertoire. In 1967, he was the star of Les Blank’s documentary The Blues Accordin’ to Lightnin’ Hopkins. He toured around the world, and made appearances on Austin City Limits in the 1970s, establishing himself as one of the leading country blues figures of his day. After performing professionally to great acclaim in five consecutive decades, Lightnin’ Hopkins died of esophageal cancer on January 30, 1982. Gold Star 662 was recorded around July of 1949 at 3104 Telephone Road in Houston, Texas. Lightnin’ Hopkins sings and accompanies himself on guitar; on side “A”, he is backed on slide guitar by Harding “Hop” Wilson. Firstly, Hopkins sings “Jail House Blues”, a quintessential country blues song drawing inspiration from the “floating verses” endemic of the blues, and with the slide guitar accompaniment adding a bit of extra zest to Lightnin’s own playing. 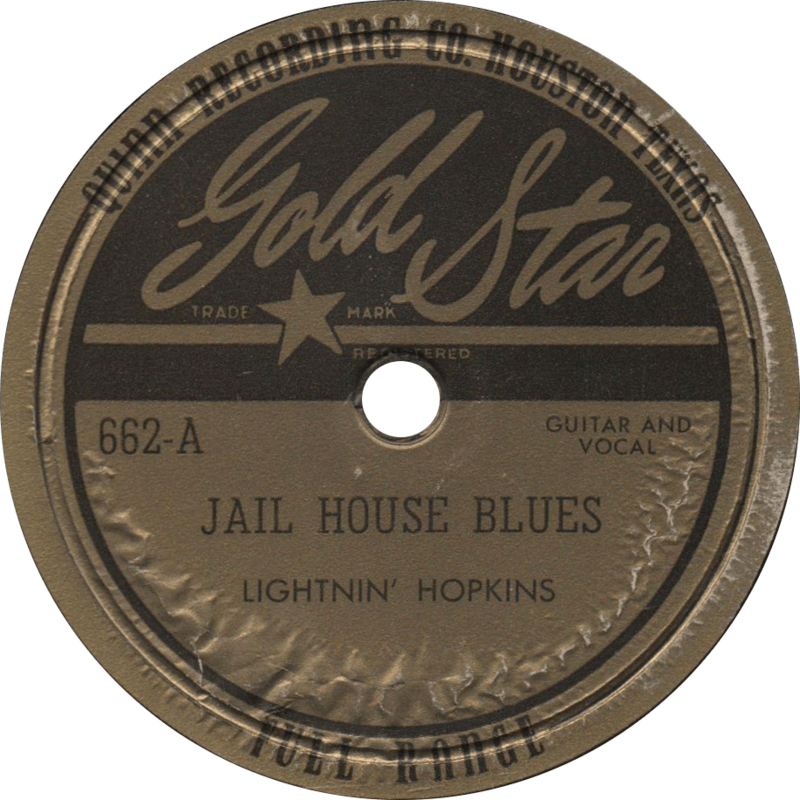 Jail House Blues, recorded c. July 1949 by Lightnin’ Hopkins. One of Lightnin’s bigger hits of his early career, he sings and plays solo on “‘T’ Model Blues” (“Lord, my starter won’t start this mornin'”)—a masterful blues that sends a shiver right down my spine. 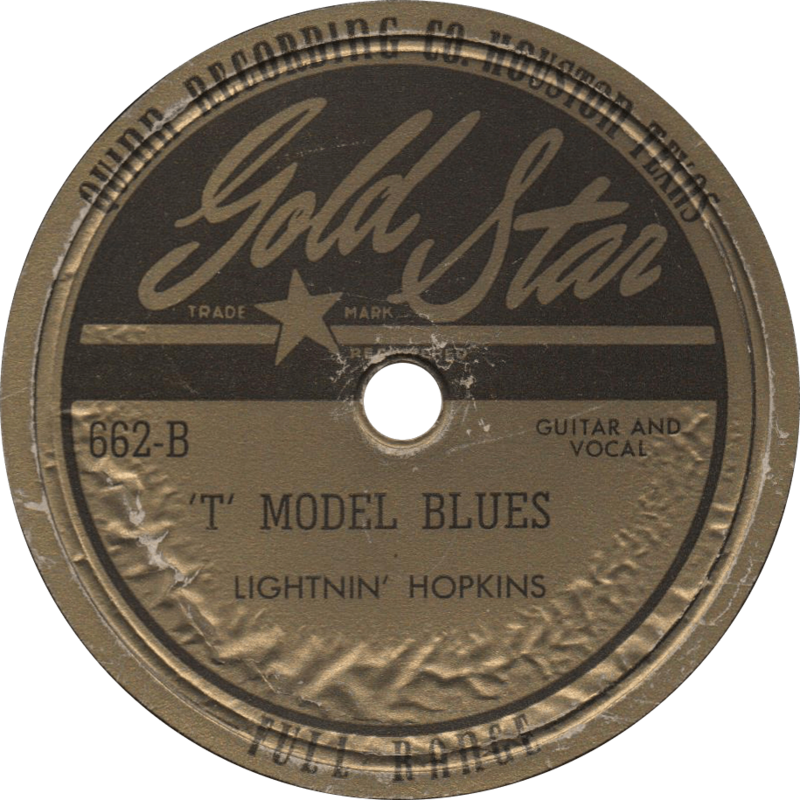 ‘T’ Model Blues, recorded c. July 1949 by Lightnin’ Hopkins. When the last man dies, who’s gonna dig his grave?